Our Rastakhan’s Rumble Secret Hunter deck list guide will help you learn how to better pilot this deck. 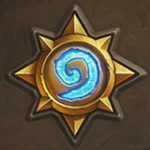 Our guide features mulligan, play, and card replacement strategies! Hunter is one of the three, or four if we count Rogue (which only got Secrets in Kobolds & Catacombs) Secret classes, alongside Paladin and Mage. And the class’ Secrets were always in between – not as high tempo as Paladin’s, and not as high impact as Mage’s. However, their versatility, rather low mana cost and Eaglehorn Bow synergy has made them playable in many metas before. That said, until One Night in Karazhan adventure, they were just slotted into Midrange build most of the time, players haven’t seriously attempted to build a Secret Hunter, because it simply wasn’t worth it. And then Cloaked Huntress and Avian Watcher were released – that’s when players first started running a Hunter deck specifically built around Secrets. It had some brief moments, but for the majority of time since then, it wasn’t a viable deck. However, over the last few expansions, Hunter was getting more and more Secret synergies. 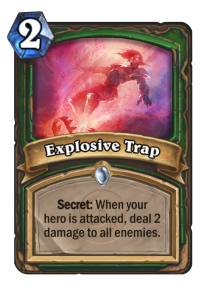 Most notably, cards such as Lesser Emerald Spellstone, Subject 9 and Masked Contender are the new Secret synergies that made the deck viable again. On top of those, Secret Hunter can utilize the new Hero card – Zul'jin – which replays all of the traps alongside a significant board. Recently, Midrange and Secret Hunter sort of merged into a single build, usually called Secret Hunter (since it pretty much replaced the deck in the ladder as well as tournament meta) or Hybrid Hunter. It combines the Secret synergies with Beast-only roster to utilize strength of a new card – Master's Call. This version of Hunter is one of the most successful decks on the ladder right now. Find more versions of this deck type on our Secret Hunter archetype page! Dire Mole – Since you’re playing a proactive deck, you want to open with a 1-drop, and Dire Mole is your best 1-drop. Springpaw – Keep only if you don’t get Dire Mole. You still want a 1-drop, but you don’t need both. Crackling Razormaw – 2 mana 3/2 is often a good T2 play by itself, but if you have a Beast in play already, then it becomes absolutely nuts. High-rolling on the right Adapt can carry the entire game. Lesser Emerald Spellstone – Might feel weird to keep basically your most expensive spell, but it’s your main win condition – putting a fully upgraded Spellstone on Turn 5 is going to win you the game a lot of time. Candleshot – Keep against Aggro. Great 1-drop weapon, especially against fast decks. Kills any 1 health minion right away, also makes your early trades much better. And most importantly – at no health expense, which is important when you face other fast builds. Wandering Monster – Keep against Aggro or with Spellstone. It often gets 2 for 1 or at least makes things awkward for your opponent’s early game minions, and it upgraded Spellstone if you have it. Scavenging Hyena – Keep with a 1-drop. By itself it’s pretty weak, just a 2 mana 2/2. But if you can open with a 1-drop and trade it off after playing Hyena, it suddenly becomes a proper threat. Animal Companion – Keep with a solid hand, most likely T1 and T2 play already in there. In slower matchups you can keep it without a 1-drop. 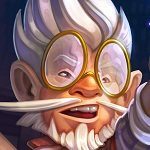 Master's Call – It might seem that drawing 3 cards for 3 mana is just nuts and you should always keep it, but you only do it in slower matchups. Against faster decks, you can’t afford to skip Turn 3 and you’d rather have a stronger curve. Deathstalker Rexxar – Keep against Warrior. You will rarely be able to kill Odd Warrior (or Odd Quest Warrior) with your regular cards, you will absolutely need the help of Rexxar, you can’t afford it to be on the bottom of your deck. Your general play strategy revolves about two things. The first are (obviously) Secrets. And the second are Beast synergies. Let’s first talk about the first win condition. Hunter Secrets are really mana efficient, but the problem is that your opponent can play around them – you don’t control the timing they’re triggered, but they do. Explosive Trap is a great example. Paying 2 mana for 2 AoE damage (including face damage) is an amazing deal, the card would be an auto-include in every deck in the game. However, the problem here is that it doesn’t trigger immediately – you give your opponent time. And so, he can answer it by trading minions on the board first, healing them, buffing them up, or even not attack into it at all – just wait until you inevitably play something and then trade the 1-2 health minions into it. Freezing Trap is similar – 2 mana for a better Sap is insane, but once again, it’s the opponent who controls the minion he attacks with. He might ignore it completely or try to freeze a small minion instead. However, one of the advantages of this deck is that it play Secrets en masse. It’s easy to play around one once you identify it, it might be much harder to play around 2-3 at the same time, especially since this list runs five different Secrets. Identifying which one you’ve just played might take a while, and it might disrupt your opponent’s game plan too. It gets even better when you play your Zul'jin and have 5 of them up at the time – even if your opponent knows which one you have at this point, it will still be hard to play around them. However, recently, the deck has strayed from being 100% Secret focused and started running Beast synergies too. That’s thanks to the new Rastakhan’s Rumble card – Master's Call. Not only it draws 3 cards for 3 mana, which is insane (normally drawing 3 would be costed at 5), it also draws specific cards – Beasts – which often have synergy with each other and are solid threats. Another advantage of Master’s Call is that it increases your chance to get Subject 9 each game heavily. With 10 Beasts in your deck, even in the worst case scenario (if you don’t draw any Beasts before playing it), that’s 30% chance to get it. Realistically, the chance is usually much higher. And then Subject 9 gives you a lot more steam. And finally, the card’s last important role is drawing Beasts you’ve buffed with Dire Frenzy. That’s why ideally, if possible, you want to save Master’s Call for after you’ve played Frenzy. Talking about Frenzy. The truth is that no matter what you buff, it’s still worth it. Even buffing Dire Mole means that you shuffle a bunch of 1 mana 4/6’s into your deck, which is a great tempo play. But of course, ideally you want to get something else. Some of the best targets include Crackling Razormaw (2 mana 6/5 that Adapts something), Scavenging Hyena (since it starts off as 5/5, it’s harder to kill before it snowballs), Huffer or Misha from Animal Companion (either 7/5 Charge or 7/7 Taunt – the first is better against Control, while the latter is amazing vs Aggro) as well as Tundra Rhino (5/8 Charge + it’s harder to kill, meaning that it has a solid chance to stick – and once it does, you pretty much win the game). The last one is especially powerful vs slow decks. Not only you get a huge Charger for 5 mana, but every time you drop it you can also play some Beasts and deal even more damage. For example, play Rhino + Crackling Razormaw (let’s say you get +3 damage) + 2x Springpaw and you can suddenly deal 13 damage out of nowhere. Since you shuffle three copies of it, you can repeat the same thing multiple times and often kill opponent with Chargers, even though otherwise he would deal with your board. 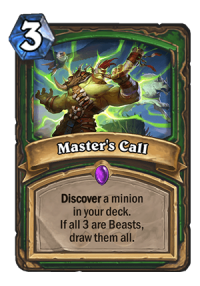 But no matter what you buff, it’s great, especially if you can follow it up with Master’s Call. 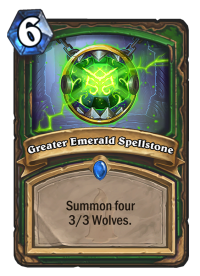 But since you’re still playing a Secret build, a lot of your wins will be based on an insane tempo swing provided by Lesser Emerald Spellstone (or rather Greater Emerald Spellstone given how easy it is to fully upgrade it). This deck does not have a hard time activating it – if you draw it early, then it’s nearly always fully upgraded on the curve. And 4x 3/3 minion for 5 mana is amazing, there are no 5-drops that can match it. You force your opponent into one of the three things – having AoE to clear it (and some decks just don’t have it – e.g. Aggro), using lots of resources to clear it (e.g. trading onto the board, swinging the weapon and something else) or leaving it and taking LOTS of damage. And it’s really lots of, 12 damage per turn can often put your opponent on 2 turns clock if you add some Hero Powers / weapon damage / Kill Command. Sometimes it might be worth it to take things slower too. If you’re playing against a deck with a lot of board clears and you get your Spellstone late into the game, you can actually wait until Turn 10, when you can play it alongside Tundra Rhino. It creates a massive board, but also pushes for 14 damage right away. It will often be enough to straight up kill your opponent, but even if not, dealing 12 damage from hand is a solid use case for Rhino, considering that playing Spellstone alone would probably result it in getting cleared. Sadly, with only two Spellstones in your deck, you can’t always rely on winning the game thanks to them. But you still have some others ways to do it. And last, but not least, we have two Death Knight cards. – Deathstalker Rexxar and Zul'jin. Both are great win conditions – DK Hero is played in basically every Hunter deck, while Zul’jin found its place in more spell-based builds. Let’s stalk about Deathstalker Rexxar first. Its main advantage is that it lets you win the games that you would otherwise had no business winning. Against Druid that stacked so much Armor that you would never get through, against Control decks that outvalued you, against Aggro decks where they would kill you a turn or two from now etc. The initial Armor + AoE is useful, but its real power lies in the Hero Power. You can Discover a Beast every turn, and since you can combine two of them, there is a very high chance that you will get exactly what you want. Poisonous, Charge, Rush, Lifesteal, maybe some effect like AoE damage, maybe giving your other Beasts more Attack, maybe shuffling something into your deck – doesn’t matter what deck you play against, it will be useful. That said, playing Deathstalker Rexxar on curve is often a big, rookie mistake. It might be correct against Aggro if you’re clearing the board or you need healing, but against slow decks you’re the beatdown and your normal Hero Power is suited for that role very well. 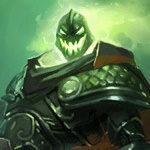 If you still have resources and you CAN try to seal the game with your current hand, or your opponent is low on health, then it’s usually better to keep the damage Hero Power – it puts more pressure. Turn into Deathstalker Rexxar once you’re (nearly) out of cards or when you know that the beatdown plan won’t work – you had a weak start, your opponent has answered your Spellstone, he won’t die any time soon etc. Then just play Rexxar and hope for the best. Probably the only matchup in which Rexxar on curve is correct is Odd Warrior, but that’s still not a given. If you have initiative and other plays in your hand, you might want to keep putting pressure, because losing 6 mana doing nothing immediately is not a great move. However, that’s the only matchup in which your Hero Power just feels completely useless, because Odd Warrior can gain so much Armor that it’s very hard to kill him. 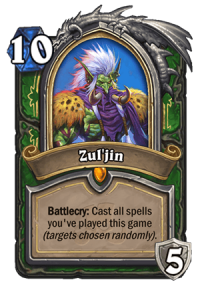 Then, we have another Hero card – Zul’jin. 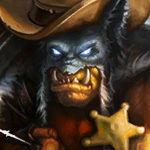 Even though this one is more expensive, ideally you’d want to play him first and only then turn into Rexxar. Unlike Rexxar, whose power lies in Hero Power, Zul’jin is strong because of its Battlecry (Hero Power is only a minor upgrade, letting you hit minions for 2 damage too, but most of the time you want to target face anyway). Replaying every spell you’ve cast this game means that you get all of your Secrets back up (most of the time lighting a full Christmas Tree around your Hero portrait), but also a full of nearly full board, since you replay the minion-summoning spells too – Animal Companion, Flanking Strike, Lesser Emerald Spellstone. If you get lucky enough, you might also get a nice minion kills / face damage with Flanking Strike / Kill Command, but given the random nature of the spell, it has a significant chance to hit your own minions. As an extra note, some of you might wonder why the deck doesn’t run Secret Plan? There’s a simple reason, actually – it can’t be drawn with Subject 9, and you only can run so many Secrets. 9 Secrets this deck runs is generally more than enough, you don’t need to add more, but you really want to have at least 5 different Secrets, so Subject 9 pulls as many of them as possible. Subject 9 – While technically you CAN play the deck without Subject 9, it’s a very strong card in this build. Given the amount of Secrets you run, it will usually draw you 2-4 cards. 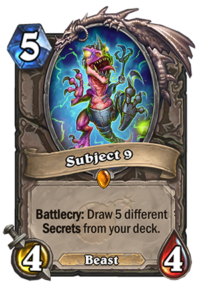 5 mana 4/4 that draws you 3 cards on average is absolutely nuts and the main reason why the deck became a thing in Boomsday Project at all. Without it, you will run out of steam much more consistently, and it will be harder to find the cards you need, as you would often topdeck a Secret in the late game instead of your big plays (Subject 9 filters through the deck really well). It will also make your Master's Call worse. But if you really want to play the deck without it, there are some replacements you can make. Second Tundra Rhino or Unleash the Hounds are probably the best replacements. Alternatively you can try out Eaglehorn Bow or Savannah Highmane. 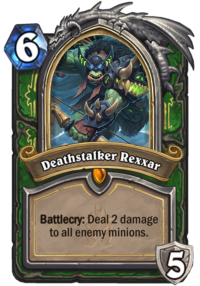 Deathstalker Rexxar – I’d honestly say that you can’t play any Hunter deck competitively without Rexxar right now. It adds a massive win condition in slower matchups and lets you win games which you wouldn’t be able to win at all without it. But if you REALLY want to do it, you should probably drop the idea that you will be able to beat some slow decks and instead add e.g. a second Explosive Trap to make your faster matchups better instead. 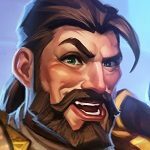 Zul'jin – Just like Rexxar, Zul’jin is a huge power play and one of the deck’s main win conditions, but I’d say that it’s not AS important as Rexxar. It’s an amazing card in Spell Hunter, but given that Secret Hunter is generally more aggressive, faster deck, a 10 mana play is sometimes too slow. Of course, the card is still great, but it’s not absolutely necessary. If you want to get rid of Zul’jin, I’d go for one of the substitutions I’ve offered next to Subject 9. Master's Call – Absolutely irreplaceable. I mean, you can try going back into the previous Secret Hunter build without Beast package, but it’s MUCH worse. This card is a powerhouse, amazing refill tool and sometimes even a tempo tool after you’ve dropped Dire Frenzy (because playing those cheap, buffed minions is an amazing tempo gain). In this specific version, there is no replacement for it. Snake Trap – Snake Trap is an Epic, but it’s probably the best Secret (or at least one of the best) in the entire build. But it doesn’t mean that you can’t play the deck without it. You probably should replace it with another Secret, especially once that’s not played in the deck already (so Subject 9 can draw more cards). Snipe is that option, but it’s mostly a meta call. Alternatively you can go for 2nd copy of one of the Secrets already played in the deck. Is this *really* a Secret Hunter deck any more – it runs more beasts than secrets… and the secrets seem to be in there to basically generate more beasts by powering the spellstone. It’s not a million miles off the aggro Beast Hunter decks of old that used to run a few secrets to fuel the Eaglehorn Bow. It’s the new Secret Hunter basically, a lot of people call it Hybrid Hunter now, because it’s somewhat a hybrid between Secret and Midrange builds. The old Secret Hunter with more Secret synergies and without Beasts is basically no longer played, this build pushed it out completely. Freezing Trap and Wandering Monster help control the board or potentially debuff a minion (e.g. 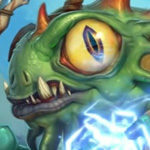 do you attack before dropping a Spikeridged Steed and risk a Wandering Monster killing your minion – but if you play the Steed first and it’s Freezing Trap … ) while also fuelling the spellstone – and you don’t want that dropped with a Rhino on the board. In a weird kinda way, I sort of like playing against this deck – it’s beatable (depending on draw of course) but you have to think your way through the game more than most as it’s got so many options available. That’s mostly why it pushed out the regular Secret Hunter. It’s more flexible, has more win conditions and more ways to approach the game. Secret build was too reliant on a good Spellstone turn to win the game and it ran out of steam quite quickly without DK Rexxar. This one, with good draws, can have a powerful turn after a powerful turn, board refill after board refill and then still an amazing late game with Rexxar. It’s definitely near the top of Tier 1, maybe even taking the #1 spot (it heavily depends on the local meta around each rank, but it’s super powerful). How is Houndmaster Shaw not in the deck? Must have in any serious Hunter deck. Might want to add Masked Contender to the guide, seems to be a staple now. There are no replacements for Rexxar DK, it’s a staple in basically all Hunter decks. Singlehandedly wins you the game vs Odd Warrior and some Aggro matches. Zul’jin is great, i would say better than Rexxar, btw its rotating in 4 months as you said. I’d say a second Dire Frenzy. You’re not going to have the OP infinite value that is DK Rexxar, but its only 40 dust and it will give you a little extra burst of gas which might be enough in some games. This deck seems to be performing really well in the meta at the moment. Out of all the decks that I tried post nerf, this is the one that I am getting the most joy from. I’ve noticed that this deck is AMAZINGLY better in wild, using cloaked huntress (her combos with secret keeper and subject 9 are too good to pass up) and cat trick. Just last season, I got to rank 5 from 20! If I remember correctly, I went like 22 and 7, or something like that. is Professor Putricide really better than Houndmaster Shaw? There are a few matchups that I struggle with. Any sort of combo deck is difficult. I try to play the agrresor role but they just shut me down. Should I attempt to go the long game? Also control matchups against decks that can heal or get armour such as Warlock and Druid, how do you recommend I go about those? Overall it’s a good deck, it does surprisingly well against aggro. I enjoy versatile decks that have a chance against all archetypes, especially aggro. I hear you. Yes there are a few issues with this deck vs slower decks. Two matchups that you can really improve on is Pala (odd pala) and Druid, just switch out Proffesor Putricide with a Mossy Horror. The horror can clear vs Palas and also gets rid of the 1/5 taunts summoned by Druid (im guessing you hit that wall with the wolves a few times?) IMO Putricide is not that great in this deck, I kept hitting potentially problematic secrets. Is this deck version performing better than Trumps version with Secretkeeper, Houndmaster, diremole, etc?